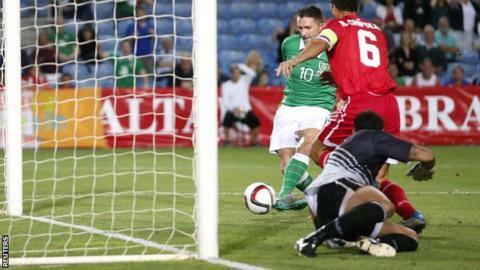 Robbie Keane scored twice as the Republic of Ireland brushed aside Gibraltar in Faro to boost their hopes of qualifying for Euro 2016. Striker Keane netted from close range in the second half and added a penalty, before Shane Long's powerful header. Cyrus Christie had broken the deadlock, smartly rolling into the bottom corner for the only goal of the first period. With Georgia beating Scotland earlier, Ireland moved up to third place in Group D, two points behind Poland. The Poles lost their unbeaten record with a 3-1 defeat by Germany, who climbed above their opponents to the top of the table. Martin O'Neill's side were not expected to be stretched by a side that had conceded 34 goals in their first six games in the group and duly collected all three points. Gibraltar rarely threatened and were given warnings early on. Aston Villa's Ciaran Clark headed against the woodwork and Stoke striker Jonathan Walters had a goal disallowed for offside before the goals came. What does Ireland's win mean? Scotland's 1-0 defeat in Tbilisi has given the Irish renewed optimism as they look to finish in one of the top three places in the group. The top two qualify automatically, while eight of the nine third-placed teams will head to the play-offs. The Republic took that route to reach Euro 2012, and it is looking likely they will have to do the same this time in order to qualify for next year's tournament in France. Their appearance at the European Championship in Poland and Ukraine three years ago was a forgettable one, however, as they finished bottom of their group after losing all three games. Their last three games mean it is a tough task for Ireland to qualify automatically. Three points in Dublin against Georgia on Monday would enhance their hopes, with the Scots facing a difficult home game against heavyweights Germany. However, Poland will be heavy favourites when they come up against Gibraltar on the same day. Next month is the decisive period, with Ireland at home to Germany on 8 October and away to Poland on 11 October. They are likely to need a win against one or both of those sides to have any chance of progressing automatically. The two-legged play-off ties will take place in November. Signed for £7m by Norwich in the summer, Brady showcased his skills as a winger, proving a tricky opponent all evening. He whipped numerous balls into dangerous positions and if he can provide that kind of service at club level, the Canaries' strikers will be licking their lips. Republic of Ireland striker Robbie Keane: "We said before the game we had to be patient - we knew it was going to be difficult. They are a very different team from when we first played them, so all credit to them. "There is still a long way to go but we got the job done. Monday will be a massive game for us. The three points in Georgia at the start of the campaign could be massive for us." Republic of Ireland manager Martin O'Neill: "I never thought we were out of the group, we had to win four games. This particular weekend was important for us, the Georgia-Scotland game was always going to be a difficult match so I am delighted we have won. "Even if Scotland had won, it was still in our hands. This will give us a good boost of confidence and Georgia will come with renewed confidence themselves after their win. "The first goal was a relief when it came. It was a great effort from Robbie Keane and I didn't realise he was only one behind Gerd Muller (68 goals). Very nice." Robbie Keane has now scored five goals in total in the Republic of Ireland's two Euro 2016 qualifiers against Gibraltar. Only four Europeans - Ferenc Puskas (84, Hungary), Sandor Kocsis (75, Hungary), Miroslav Klose (71, Germany) and Gerd Muller (68, West Germany) - have more international goals than Keane (67). Match ends, Gibraltar 0, Republic of Ireland 4. Second Half ends, Gibraltar 0, Republic of Ireland 4. Foul by Ciaran Clark (Republic of Ireland). Jean Carlos Garcia (Gibraltar) wins a free kick in the defensive half. Attempt blocked. Ciaran Clark (Republic of Ireland) left footed shot from the centre of the box is blocked. Assisted by Jeff Hendrick. Attempt missed. Jeff Hendrick (Republic of Ireland) right footed shot from outside the box misses to the left following a corner. Shane Long (Republic of Ireland) wins a free kick on the right wing. Foul by Jake Gosling (Gibraltar). Attempt saved. Jonathan Walters (Republic of Ireland) header from the centre of the box is saved in the top left corner. Assisted by Robbie Brady with a cross. Corner, Republic of Ireland. Conceded by Lee Casciaro. Substitution, Gibraltar. Robert Guiling replaces Jack Sergeant. Offside, Republic of Ireland. Robbie Brady tries a through ball, but Shane Long is caught offside. Goal! Gibraltar 0, Republic of Ireland 4. Shane Long (Republic of Ireland) header from the centre of the box to the top right corner. Assisted by Jeff Hendrick with a cross. Attempt missed. Aiden McGeady (Republic of Ireland) left footed shot from outside the box misses to the left. Assisted by Shane Long with a headed pass. Attempt missed. Jonathan Walters (Republic of Ireland) right footed shot from the centre of the box misses to the left. Attempt blocked. Wes Hoolahan (Republic of Ireland) left footed shot from the right side of the box is blocked. Assisted by Jeff Hendrick. Attempt blocked. Anthony Bardon (Gibraltar) left footed shot from outside the box is blocked. Substitution, Gibraltar. Mikey Yome replaces John Paul Duarte. Attempt blocked. Liam Walker (Gibraltar) left footed shot from outside the box is blocked. Assisted by Anthony Bardon. Attempt missed. Shane Long (Republic of Ireland) header from the centre of the box is too high. Assisted by Glenn Whelan with a cross. Substitution, Republic of Ireland. Shane Long replaces Robbie Keane. Substitution, Republic of Ireland. Stephen Quinn replaces James McCarthy. Attempt saved. James McCarthy (Republic of Ireland) right footed shot from the right side of the box is saved in the top right corner. Assisted by Jonathan Walters with a headed pass. Foul by John O'Shea (Republic of Ireland). Lee Casciaro (Gibraltar) wins a free kick on the left wing. Substitution, Gibraltar. Jake Gosling replaces Kyle Casciaro. Offside, Republic of Ireland. Cyrus Christie tries a through ball, but Robbie Keane is caught offside. Hand ball by Kyle Casciaro (Gibraltar). Goal! Gibraltar 0, Republic of Ireland 3. Robbie Keane (Republic of Ireland) converts the penalty with a right footed shot to the bottom right corner.